Oh yeah! That's what I'm talkin' about! California's Slough Feg, formerly known as The Lord Weird Slough Feg, has released their crowning achievement. Ape Uprising is an awesome collection of NWOBHM-inspired classic-type metal that is sure to please all old-school metalheads that are lucky enough to get their hands on this puppy. I'd be shocked if there were many Dangerdog Music Reviews regulars out there that didn't like this disc as much or more than I do. In all honesty, I've never been a huge fan of Slough Feg. I will say that their best songs are killer, top-notch metal tunes that can hang with the best of 'em. Unfortunately there is usually only one or two of those per album. Not this time around. Ape Uprising is jam-packed full of those killer songs. In fact I don't think I could single any of these out as the best on the album because there aren't any weaklings. They all sound great collectively, or on their own. What is the difference this time out? The band has experimented a bit with both style and structure and really showcases their musical talents on this CD. The first thing you'll notice is the opening track 'The Hunchback Of Notre Doom.' This is not merely an intro or segue but a full-fledged doom metal track � a first for Slough Feg even though they pull it off like they've been doing it all along. And while the rest of the tracks sound more like good ole American power metal, they all have qualities you might not expect to hear from Slough Feg. 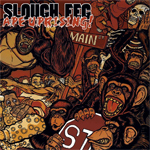 Most notably, the vocals and lyrics, both solid in their own right and usually the focal point of every Slough Feg album, take a back seat to the relentless jam session that accompanies them. Slough Feg doesn't wear out their welcome either. At just over 37 minutes, there just isn't any room for filler. Ape Uprising is one of the best power metal albums I've come across in recent years. In all honesty, I've never been a huge fan of Slough Feg. Ape Uprising is one of the best power metal albums I've come across in recent years.